I saw this book when I was researching English in the 1920s for my novel. The topic intrigued me and I thought it would be an interesting read and that I would still learn a thing or two while I listened to it. In retrospect, I should have known better. What I do know of Bill Bryson is that he’s an entertainer, not a scholar and while he’s good at researching and fact-finding, he’s not going to write a textbook when that’s more what I needed. In Made in America, Bryson de-mythologizes his native land, explaining how a dusty hamlet with neither woods nor holly became Hollywood, how the Wild West wasn’t won, why Americans say ‘lootenant’ and ‘Toosday’, how Americans were eating junk food long before the word itself was cooked up, as well as exposing the true origins of the G-string, the original $64,000 question, and Dr. Kellogg of cornflakes fame. This book was a lot more of a history of American than a history of the language. The beginning focused a lot on language and pronunciation, which I enjoyed. He talked about differences that developed between the British and Americans, but I felt from there, he devolved into a critique on American business and history, taking only the occasional detour to talk about language and how the topic at hand impacted language. Bryson went on at length about the creator of baseball and who it really was and why it’s been popularized to be a different gentleman than he says it is, etc. However, he only talks on language impacts for a few paragraphs at the end of this section. I felt the book lost its focus and that was upsetting. I enjoyed the beginning when Bryson talked about the pilgrims, early settlers, and founding fathers. I thought this section stayed on topic and I learned a lot about the differences in American English. However, as the book went on and moved to parts of culture that impacted the language, I felt there was more commentary on political and private industry actions than there was on the language changes that took place as a result. I liked using time as a progression in the book rather than subjects; it gave me a better overall look at how things were changing because the jump forward in backward in history with each subject didn’t give me an idea of what speech would have been like in a given period. If you can’t tell from my comments already, I disliked the sports section of this book. Bryson admits that there are very few words or phrases that have entered our language from sports alone, yet he went on about it for a whole chapter. The list of words impacted by sports could have consisted of a single page and I felt the topics discussed would have been better suited in a sports history book. The audiobook I listened to was narrated by William Roberts. I thought Roberts did a really good job with this narration. There were a lot of words from foreign languages that were mentioned when talking about the foreign impact on the English language. I only know Spanish and his accents on these words were good. I can’t speak for his Dutch, French, German, and Yiddish, but I believe he has enough resources as a narrator to find proper pronunciation for them all. This book was very dry and Roberts brought life to it. Bryson is in a unique situation to write this book. He’s American by birth but spent a long time living in the UK and probably had to deal with his ‘Americanisms’ being criticized by Brits. I felt this book was a way to justify his speech and the ‘improper English’ that is spoken in the states. The French and Spanish are very precise about their language while English evolves constantly. Dictionaries add words all the time (selfie) and I’m sure there must be words taken out to make room for them (ain’t). Whether the British like it or not, Americans are going to twist the langue to make it fit our needs, just as we’ve done since the Pilgrims landed (not at Plymouth Rock according to Bryson). Writer’s Takeaway: I thought the book lacked focus for stretches at a time. Bryson would go on a tangent loosely related to a topic that had a minor impact on language and I would grow board. I picked this book up because I’m genuinely interested in the topic, not (as I suspect many did) because Bryson wrote it. If I were a fan of his, I’m sure this wouldn’t have bothered me so much. But as someone with scholarly intentions, I felt it fell flat. The history before 1850 gave me some good information, but the modern-day didn’t do much for me. Well written and narrated, but off topic for long stretches. 3 out of 5 stars. Currently reading: I’ve had enough long waits at doctor’s offices this past week to make some progress with Cloud Atlas by David Mitchell. I’m at about 60% or so and I’ll make my way to the end soon enough. I’m getting close to the end of Fahrenheit 451 by Ray Bradbury. I’m enjoying it a lot. Bradbury makes for good fall reading. Even though he’s not writing horror, his books have a creepy vibe to them that goes well with Halloween. 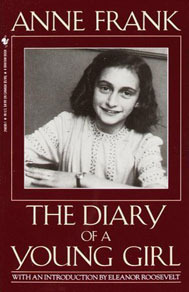 I started the audiobook for The Diary of a Young Girl by Anne Frank late last week. The play stuck really close to the transcript so there haven’t been a lot of surprises yet and I don’t think there will be a ton. I’m blown away by how insightful Anne is and how well-written her diary is. It’s such a testament to how writing is less of an art these days. I’ve only got through the very beginning of Sense and Sensibility by Jane AustenI hope to get back to reading this seriously around Christmas. My book club met Monday night and we’re picking up Crossing to Safety by Wallace Stegner for our next meeting. We’ve read Stegner’s book The Angle of Repose a few years ago and really enjoyed it so this one should be fun! 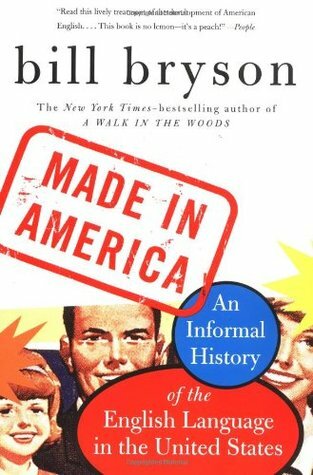 Recently finished: I finished Made in America: An Informal History of the English Language in the United States by Bill Bryson on Thursday. I should know better than to do non-fiction in audio because it’s hard to get into it when it’s read aloud. I gave the book 3 out of 5 stars. Saturday morning I refused to get out of bed until I’d finished Out Stealing Horses by Per Petterson. I was hoping for a bigger ending, but I was still happy with how it ended. The writing was beautiful even if I felt the plot was a bit slow for my taste. I gave it 3 out of 5 stars as well. Two book reviews in this past week. I’ve been keeping up well! The first was What I Talk About When I Talk About Running by Haruki Murakami. I gave the book 4 our of 5 stars. 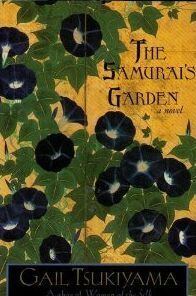 The second was The Samurai’s Garden by Gail Tsukiyama. I had mixed feelings on that one and gave it 3 out of 5 stars. Reading Next: I’m still planning on Slaughterhouse-Five by Kurt Vonnegut being my next audiobook. I don’t have a lot of plans besides that because of how many books I’m starting into. Stay tuned for sudden changes in plans. Reading a local author is fun. Especially when he sets his book in your local area (though you’re unable to identify the river in the book) and one of his friends from high school is in your book club! If only my tweets had gotten him to join us. There were a lot of comparisons to ‘The Walking Dead’ in our discussion. A fellow member and I were reminded of Terminus when Malorie reached the school. We were both afraid she’d be eaten! The man at the end is even named Rick, the main character from ‘The Walking Dead.’ In fact, this book was ready to publish in 2007 but publishers delayed publication date because they felt the market was too saturated with the genre. Fortunately, it has been optioned for film. I’d be curious to see how this could be made into a film when so much of it is about not being able to see. We talked a lot about the title. The bird box didn’t seem to be a very big part of the plot, but the author thought it was important enough to merit the title. We thought it was an allegory for being on your own in a small, dark little world, but Malerman has come out and said that’s not true. The box is very similar to how the housemates lived in the house, shut off from everything outside and afraid when something came near. People in the book either died violently and quietly. The contrast between Tom’s daughter and George are startling. We think some died quietly because they knew what they were going to see, they knew they were risking something when they opened their eyes or peeked. We suspect some of them killed themselves before completely losing their minds so they couldn’t kill others. Or maybe, as Gary suggests, people are affected differently and some of them wouldn’t get violent. I don’t like the idea of Gary being right about anything. The scene where Malorie almost blinds her children was disturbing. In reality, why wouldn’t she? The children would be much safer and live better lives if they didn’t have to worry about seeing something that could kill them. We thought it was a sign of hope that she didn’t take their eyesight. She had to believe that things would get better to keep their eyes. Not giving them names could be construed as a sign of hope as well; that they would someday live in a world where names to distinguish one Boy from another were needed. Though we also would have been able to guess the climax from their names and would have known they weren’t twins. Malerman commented on this as well and said Malorie didn’t name the children because names were a luxury to her. They didn’t help her survive so she didn’t need them. We had a lot of discussion about the creatures. Were they real? Was Gary the monster? Or was Gary right and it was the idea of something that was scaring people? We thought the ending scene where Malorie’s blindfold is lifted off her face implied that they are real creatures with real mass. That begged the question: Do these creatures know what they’re doing? Are the purposefully destroying humans on earth? We suspected this was the case only because of a scene toward the end. The birds that die in the skies have survived for more than four years. With how quickly a human died when looking out a window, we suspected that the creatures could choose to affect someone or something and chose to affect the birds to cause Malorie and the children distress. If the effect was mental like Gary thought, the animals wouldn’t be affected but the blind would. Gary came off as very odd and less developed than the rest of the characters. We thought this was purposeful because our conclusion is that he was crazy. He was crazy enough not to be affected, like the man on the river. Some of us wondered if the man on the river was Gary, but we thought he would have said something creepy to scare Malorie and she likely would have recognized his voice. A few members were dissatisfied with the ending of the book. They felt it was lacking and to an extent, I agree. The whole book, the reader is trying to figure out what these creatures are and we never find out. It felt like the school was a very contrived way to end everything neatly. Though how the ending could have been satisfying is hard to say. For a while, we thought Tom was going to be alive because Malorie heard his name on the speaker and we didn’t know about his death yet. That might have been satisfying, but not fitting. In the end, how much better off was Malorie? It still could have been a Terminus kind of situation, she had no reason to trust the people there. How much longer could Malorie have survived alone? It seemed like her food supply should have run out long before the children were four. She’d have to have a lot of trust in these people she’s just met. What if there’s a breach again and they want to blind her and the children? She might have been better off alone. We enjoyed the pacing of the book. It was enough to keep us on our toes and a lot of people (like me) raced through the book. There were a few characters we didn’t think were necessary to the plot, specifically Felix and Cheryl. The only thing this book lacked was sexual tension and that seems like something they could have added. You could argue there might have been something between Malorie and Tom, but I never felt like that was going to happen. 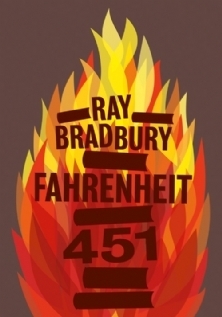 Our next book is Fahrenheit 451 by Ray Bradbury. I’m listening to the audio now and didn’t realize how much I’d forgotten since I read it in high school. It’s sure to be a fun discussion. Has anyone else noticed there are a lot of books about World War II era lately? I’ve read a lot, but maybe that’s just me. What I’ve noticed is that a lot more of them are focused on the Asian aspect of the war and I find that really interesting. This book focused on a part of the war I’d never considered, the Chinese and Japanese aggression in the late 30s. This was something I didn’t know anything about it I liked learning about it through a book. My book club read this book after a librarian ordered it for us so I’m not sure who will like it, but I think it will be a good discussion. A 20-year-old Chinese painter named Stephen is sent to his family’s summer home in a Japanese coastal village to recover from a bout with tuberculosis. Here he is cared for by Matsu, a reticent housekeeper and a master gardener. Over the course of a remarkable year, Stephen learns Matsu’s secret and gains not only physical strength, but also profound spiritual insight. Matsu is a samurai of the soul, a man devoted to doing good and finding beauty in a cruel and arbitrary world, and Stephen is a noble student, learning to appreciate Matsu’s generous and nurturing way of life and to love Matsu’s soulmate, gentle Sachi, a woman afflicted with leprosy. This is the most character-driven story I’ve read in a long time. It was refreshing in a way, but also reminded me why I like plot-driven stories. Stephen comes to Tarumi sick and leaves not only recovered, but renewed in spirit. No singular thing happens to change his life course, no discovery is so profound that it changes him forever, but through a series of events and learnings, he grows. Matsu is an interesting agent for these changes because Matsu is so quiet and stoic, an unlikely character to lead Stephen on this journey. Sachi was an interesting twist to add though I’m still struggling through her purpose. Overall, I had some mixed feelings on this book. I enjoyed it while reading it, but in reflection I didn’t get much out of it and felt there was a lot more I would have liked to read about these characters afterward. The characters were believable to me. I thought that for such a small cast, the characters had a wide variety of personalities. Matsu seemed hard to believe at first but as his story came out and we learn more about his sister and Sachi, he’s easier to understand. I wished Keiko was better developed because she seemed to have so much more potential as a character. I wanted to understand better why Stephen was so attracted to her. Sachi was my favorite character. I thought she had the best story and I liked how we learned about her as the story went without too much being revealed at the beginning. She grew on me slowly and that made it more fun. In the beginning, I didn’t know what made her so strong yet shy. Those things seemed at ends with each other to me. As I learned more, I saw her as a woman who refused to give up but was still ashamed of how she looked. Matsu was the source of her strength and she learned to be strong when he wasn’t around. Stephen was a good narrator because he was easy to relate to. His situation reminded me of starting a new job; when you’re thrust into a situation with strangers and you have to learn how to tread in order to be accepted and to make friends. He wasn’t sure how to act around Matsu and wasn’t sure when to insert himself into his new companion’s personal life. He had to let Matsu make the first moves on that front. At the same time, he’s deciding how much of himself to share with Matsu and both take slow approaches. It’s how we make friends and I think that story is relatable for most humans. I thought the fire in Yamaguchi was a great scene in the book. It helped develop the relationship between Sachi and Matsu and helped Stephen grow physically. Stephen’s health was the reason he went to Tarumi and the fire showed that poor health was no longer keeping him there. We also learned more about Matsu’s relationship with Yamaguchi and Sachi and this is before Sachi tells her story. I thought it was a well-developed scene. I thought the relationship problems between Stephen’s parents didn’t do anything for the plot. I think nothing would have been different had that not been a part of the story. It took a character I was indifferent about and made me dislike him while it made me frustrated with Stephen for not fighting more for his mother’s rights. I think it could have been left out and the story would have still been strong. Stephen changes a lot in his year at Tarumi. He sees a lot of things he wasn’t exposed to in Hong Kong and missed out on being exposed to a lot of bad things had he stayed in China. He’s able to see prejudices while avoiding bombs and witness compassion instead of ruthless destruction. Stephen left his home and education to find a new home and learn different lessons. We can learn wherever we are, even a leper village in Japan. And not all lessons are taught in schools; some we have to learn by doing. Writer’s Takeaway: The garden played a very central role in the book in a very subtle way. It was what centered Matsu and what helped give Sachi purpose when she lost hers. It was calming and beautiful. I thought it was interesting that the only painting Stephen did in the whole book was of the garden. It was a central gathering point, a common interest, among the three main characters, something no one else in the book noticed or talked about. I liked that it was a very public private secret. It helped join the characters together and though the title at first makes you think it will take a more central role in the book, it also helps point out the role it is playing. An enjoyable book, though not my cup of tea. Three out of Five stars. I’d never read anything by Murakami and when I looked into his titles, this one jumped out at me. I picked up running really casually two years ago and if it weren’t for terrible tendonitis, I’d be running until it frosted. I’ve participated in triathlons for the past two years and love the competition. So I wanted to hear from a famous running author and I got to cross Murakami off my list. Two birds, one stone. In 1982, having sold his jazz bar to devote himself to writing, Murakami began running to keep fit. A year later, he’d completed a solo course from Athens to Marathon, and now, after dozens of such races, not to mention triathlons and a dozen critically acclaimed books, he reflects upon the influence the sport has had on his life and even more importantly, on his writing. 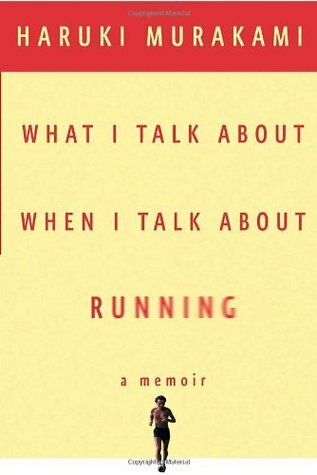 Equal parts training log, travelogue, and reminiscence, this revealing memoir covers his four-month preparation for the 2005 New York City Marathon and takes us to places ranging from Tokyo’s Jingu Gaien gardens, where he once shared the course with an Olympian, to the Charles River in Boston among young women who outpace him. Through this marvelous lens of sport emerges a panorama of memories and insights: the eureka moment when he decided to become a writer, his greatest triumphs and disappointments, his passion for vintage LPs, and the experience, after fifty, of seeing his race times improve and then fall back. This will be a much shorter review than I normally write. My structure doesn’t work well with a memoir like this. Murakami was essentially the only character, his wife mentioned very infrequently, and the plot being more of a stream of consciousness. That’s not to say I didn’t like the book, just that the style was very different from what I normally read. There were a lot of things I related to in this book. Dedication to a sport that is repetitive and can be almost mindless baffles some people. But there’s great concentration and discipline involved in it that can be very peaceful. Competing in distance events is the least competitive competition I’ve ever been a part of. I’m racing myself, no one else. Maybe if I was elite it would be different, but at my level, it’s about finishing in the time I want to. If I don’t, it’s not because someone else trained harder but because I messed up my race. I liked the parallels Murakami was able to draw between this process and writing. The discipline and time put in alone are the same. I put a lot of time into this blog that I could spend with friends and the time I spend editing stories and books could be spent with my husband. But the discipline and pursuit of a goal are so satisfying that they are the few things that can make me happy and I thrive on that. When Murakami talked about triathlons at the end, I related to every word. While Murakami struggled with the swim, I struggle with the run. We excel in the other’s weakness. But being a multi-sport competitor is a unique experience. If you can walk, ride a bike, and swim a half mile without drowning, I encourage you to try a triathlon at some point in your life. It’s a very rewarding experience. Triathlons, when done as a sport, can be frustrating and exhausting. Having to train in three sports is a huge amount of time but crossing that finish line and completing one is the best feeling in the world. My struggles are different from Murakami’s, but I knew all the feelings he was talking about. The audiobook I listened to was narrated by Ray Porter. I liked his narration. It was easy to hear him as Murakami in the first-person voice. He expressed the anguish Murakami felt and joys of running accomplishment. It read very much like a writer reading his own memoir. Not meeting goals you set for yourself is anguishing. When I wasn’t able to run in a 5K a few months ago because of knee pain, I cried. It wasn’t out of pain, but disappointment in myself. I related to Murakami’s disappointment in his slowing times and I understand the frustration of bodily failure. I read his message as dealing with what you can control. He couldn’t control the time it took for him to run a marathon (to an extent), but he could control finishing it and what he was pleased with in the experience. It’s dangerous to have high expectations of yourself sometimes and you have to set goals that stretch you but are achievable and be weary of those beyond your grasp. Writer’s Takeaway: I bet it surprised Murakami’s fans that his memoir was less about writing and growing up and focused on a small part of his life that detailed preparing for a marathon. Most people wouldn’t define it as a writer’s memoir and in fact, I see many books about running in Goodreads ‘similar reads’ recommendations. Though, writers are told to ‘write what you know.’ Murakami knows distance running. Personally, I know a lot about turtles. I shouldn’t be afraid to write about them. I shouldn’t be afraid to write about knitting and triathlons and living in Detroit. We really do have to write what we know because if it’s well written, the passion will show. A really enjoyable book that I connected with. Athletes will connect as well. Four out of Five stars. 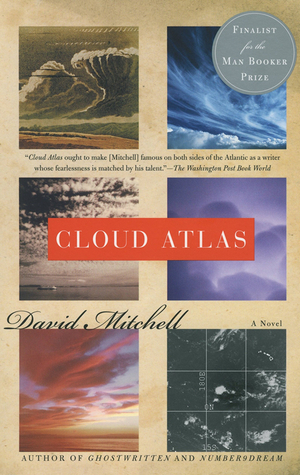 Currently reading: Not much with Cloud Atlas by David Mitchell this week. Unless it gets really interesting really quickly, I’m not sure I’ll finish it this year. Still nothing with I Am Malala by Malala Yousafzai. I’ve got to get through Cloud Atlas first. Yikes. Steady progress Out Stealing Horses by Per Petterson. The writing in this book is really great and I’m excited I’m finally finding the time to read it. I’m super close to finishing Made in America: An Informal History of the English Language in the United States by Bill Bryson. I’ve made a few longer car trips this month which helped me get through it. I’m wondering if Bryson’s other books are like this. I have A Walk In the Woods on my shelf and I hope it’s a little different as a memoir than this non-fiction. Steady progress on Fahrenheit 451 by Ray Bradbury.I’m about half-way through and I don’t remember much of the story at all. This all feels really new to me so it’s exciting to see what happens next still. Recently finished: I finished The Samurai’s Garden by Gayle Tsukiyama on Friday. I liked the ending and found it fitting, but it still felt very open-ended. This will be an interesting book club discussion. Just one book review this past week and I think a lot of you already checked it out. Please take a look at my review of Robert Galbraith’s (J.K. Rowling’s) The Silkworm. I gave it Four out of Five stars and really enjoyed the story. I’m glad she’s started a mystery series! Reading Next: I hope to start Slaughterhouse-Five by Kurt Vonnegut pretty soon as I’m getting close on 451. It’s a good time for classics. 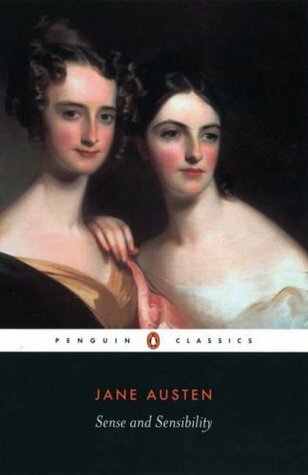 Even more classics, I should have time to start Sense and Sensibility by Jane Austen before my next book club selection. I might have to stretch this one out a bit to fit in those other books, but I’ll keep my fingers crossed. The next audiobook for my car is going to be The Diary of a Young Girl by Anne Frank. I’m embarrassed to say I’ve never read this one. I’ve seen the play, but never read the book in school or had another reason to pick it up. I’ve been admonished enough and I’m excited to read the word’s right from Anne’s hands. Is it obligatory for a writing blog to post about NaNo? No, not yet? Well, I’m sure it will be in the near future so I better get this out-of-the-way. I had two NaNo-related things happen to me so far in October and I thought it would be best to roll out this post before November 1 approached. I’m going to participate but not in the traditional sense. For those of you not familiar, NaNo is short for National Novel Writing Month (also called NaNoWriMo). The goal is to write a 50,000 word novel between midnight on November 1 and midnight November 30. You start with a blank page and finish with ‘The End.’ I did this in 2013 making me a ‘Winner.’ (May or may not have a shirt…) In 2014, I was a ‘rebel’ and instead of writing an average of 1,667 words per day, I edited for the time it would have taken me to write that much. Hate me if you want, but I can normally pound out 1,667 words in about a half hour, give or take. So that meant I got at least 15 hours of editing my 2013 NaNo in last year. I finished that up earlier this year and I’ve set it aside for now while a friend reads it. This year, I have a big obstacle in my way: School. I’m in an MBA program and the class I’m taking is very demanding. Fortunately (or not), it’s on a shortened semester schedule and wraps up November 16th. So I know that I’ll be up to my eyeballs in finance until the final is finished. I don’t want to go half-in on school and I don’t want to be stressing about NaNo so I’m pretending NaNo starts on November 17th. If I can do some work earlier than that, I will, but I won’t hold myself to a schedule. My goal until then is getting an A in this class. Starting the 17th, it’s NaNo season for me. I’ll still end on the 30th, so it’s a shortened season. All told, I should get at least 7 hours of editing in. That’s right, I’m going to edit again. I don’t like having so many projects going that I can’t keep track of them all so I want to use the time to edit again. I really enjoy the camaraderie and friendly competition that come along with NaNo and I don’t want to skip out on the encouragement and focus I find in November. So I’ll be editing at write-ins and the annual Midway Madness event that my lovely home chapter hosts. I’m really pumped to get back into the frenzy. It’s the carrot waiting for me at the end of the semester. Before this starts, I need to do some research. My book focuses on a school in the 1920s, but I’m not able to find a lot of information about the school systems at that time. I need to go to the library and spend some time with a research librarian. Honestly, that sounds like a blast to me. How about you, Reader? Are you doing NaNo? What are your goals, whether they be rebellious like mine or more standard. I wish you the best in this crazy endeavor. 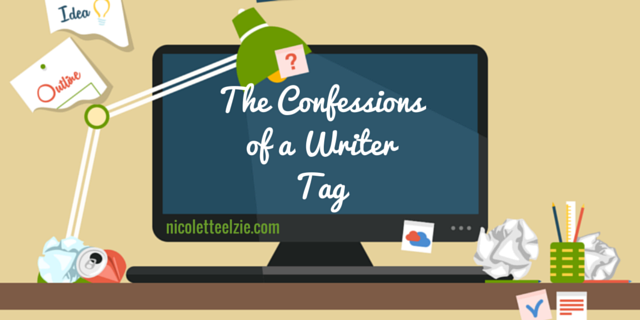 The Confessions of a Writer Tag was created by Nicolette at A Little Bookish, A Little Writerly. It is a ‘get-to-know’ the writer interview tag, dedicated to spotlighting the creative process, works in progress, and connecting to other writers. 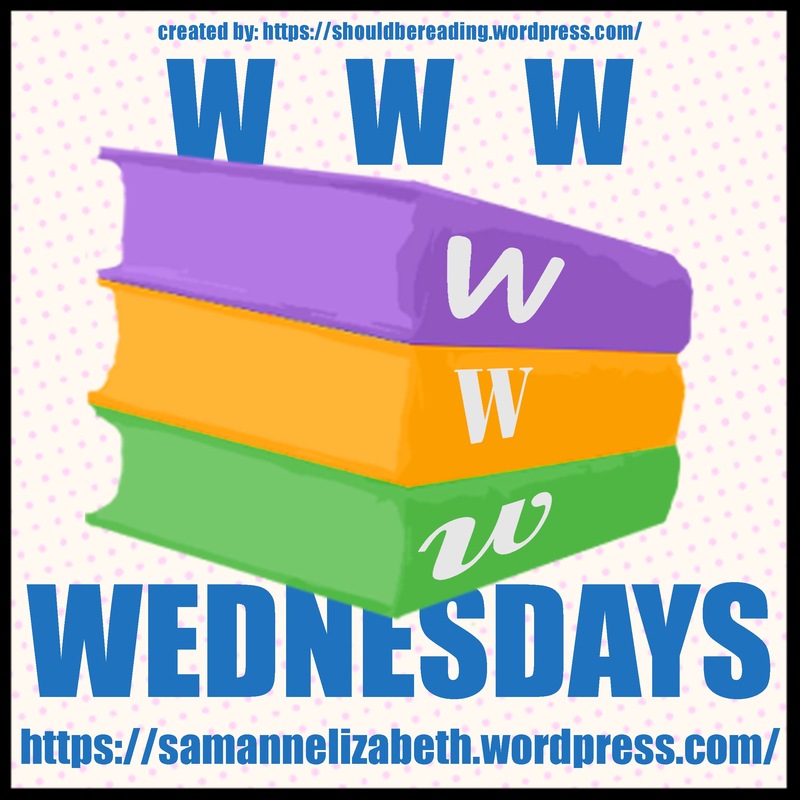 Please link back to A Little Bookish, A Little Writerly’s post, so that the original rules are always accessible to anyone who is curious and wants to participate! Acknowledge the person who tagged you in your post. Tag your friends and fellow writers – it’s up to you how many! I wrote a lot of fanfiction in middle school. I’d say that’s when I started writing. In high school, I took a creative writing course and that’s when I began writing original fiction. I began the process seriously when I graduated from college in 2012. I’ve written in a few. My novels are young adult, historical fiction, and women’s fiction. My short stories are more varied, but most of them are contemporary fiction. I have two main novel-length WIPs. The first is a YA Historical Fiction piece. I plan to start my third draft during NaNo this year. I hope to start querying it eventually, but that’s seeming farther and farther away. I began the piece after college, in 2012. My other WIP is a contemporary women’s fiction piece that I wrote for NaNo 2013. I’ve done a second draft of it and it’s out to a friend to read it. Well, it was fanfiction. I think it was for The Lord of the Rings, about an elf living in modern-day California. I don’t think I ever finished it. I also don’t think I should. Creating something that others enjoy. I love when someone reads my writing and enjoys it and wants to talk about it. Even if they disagree with what I’ve written, I love knowing that it got people thinking. Solitary confinement and back pain from my writing chair. Ouch. Gosh, I wish I had an answer for this. Between the blog, grad school, and working full-time, I don’t get much. If I’m lucky, an hour. I work best in the afternoon; after my brain is awake but before it gets groggy. No, I went to school for business and Spanish. I think the Spanish helped me understand grammar better, but it didn’t help me write any better. I look at resumes for a living and I’m most bothered by capitalization errors and unparalleled phrasing. Those two always get me. If you write, you’re a writer. It doesn’t matter how much or how good or how often. You can call yourself a writer if you write. Be bold. Write something someone won’t like. Write something you don’t like and see where it goes. The only way to grow is to try. NaNoWriMo does a great site and I look at it every year in November. I don’t tend to use many others, I mostly turn to my writer friends and my live-in-person writer groups. Here is the other reason I don’t have time to write. I’m a triathlete and physical fitness is important to me. I work out five times a week, more in the summer. I also enjoy knitting and (of course) reading. Not so fun, I’m in an MBA program August-May for the next five years. I loved Andy Weir’s The Martian and can’t wait for date night with the hubby when we go to see it. I’m not big on movies to be honest. I thought Gone Girl was well done. I have a piece coming out this month and I want to start submitting more stories to Lit Mags. I also plan to do a mini-NaNo-rebellion and start editing my YA story. I’m not sure how far that will go, but I’m looking for progress, not word count. Well, there you go! A bit more about me. I’m not going to tag a ton of people, but there are a few I’d love to share this with. Thanks for reading and if there’s anyone else out there who wants to participate, please do and let me know you did! I’ll admit I’m one of those people who jumped on the Robert Galbraith series once I found out this was a pen name for J.K. Rowling. I’m not normally a mystery fan, but I enjoyed The Cuckoo’s Calling and wanted to eventually get my hands on this second installment. Eventually came, as it often does for me, in an audiobook. Another great hit with Cormoran Strike. I’m not a big mystery person, but this was a good book for me. I liked learning more and more about Quine as we went. But, like in the first book, my complaint is what was kept from the reader that made it hard to figure out the killer. Strike is a genius and sees the small things but he doesn’t make his revelations obvious to the reader and then we’re left with a bit of shadow as we try to figure out what he’s scheming at. I liked seeing Robin’s relationship with Matthew change. I think that’s a strong running story element in the series. One of the characteristics of Rowling’s writing that I admire is her ability to create memorable side characters. Leonora and Orlando Quine, for example, will be hard to forget soon. Pippa was great, too. The characters were very flushed out, no matter how briefly they showed their faces in the story. She does a wonderful job of giving them all a personality and back story that are very unique. Robin is still my favorite character in the series. She’s very strong when it’s hard to be. Her fiance is a very dominating man and very manipulative, but Robin finds ways to work things out with him and make him see her side of them. She’s also rather fearless when it comes to detective work. I’d be terrified to pull off some of the things Strike asks her to do, especially the stunt she pulls in the final scenes. I related most to Robin, mostly because of her engagement to Matthew. My wedding was two years ago and I had to endure the awkward merging of the families and endurance of in-laws that she seems to go through. I’ve had the thoughts that I’m sure many engaged people have that my parents and family are awesome and my significant other somehow crawled out of a family of really strange people to become the person I love. Of course, this becomes easier with time, but I could remember those feelings when Robin was describing coming home for her mother-in-law’s funeral. I thought Katherine Kent and Pippa Midgley made a great sub-plot to the story. I read a bit into Rowling’s feelings on self-publishing and the publishing industry in general with these scenes. As a writer myself, I liked having her insight on the publishing industry and using these two characters as a criticism of self-publishing was a bit of lighthearted fun for me and hopefully other writers. It made me angry to read how Strike treated Nina. I felt bad for her. She was trying to help someone out and he used her. He didn’t even do it subconsciously, he did it knowingly and purposefully dumped her unceremoniously when she wasn’t useful anymore. Any attempt she made to be nice he thwarted and ran away from. It made me dislike the character for the first time. The audiobook I listened to was from Overdrive and narrated by Robert Glenister. This is the same narrator from The Cuckoo’s Calling. I like when narrators are consistent across a series so I was glad to hear him again. I thought he did a good job yet again, bringing in accents for each of the characters dependent on where in the UK they were from. I’m not very good at the different British accents as an American, but I could recognize the differences and remembered talking about dialectal differences while I studied in the UK. In the same way I wouldn’t want to hear a character from New York City with a Southern Drawl, I’m glad this narrator tried to make the character’s speech patterns consistent. Owen Quine was a very vain person. A lot of the things we learn about him concerned his need for attention and how everyone found him self-centered and at times hard to talk to. Yet they tolerated him because he’d written one (maybe two) good books. His vanity and determination of his own genius led to his downfall (not saying how!). I see this story as a warning against vanity and asking those who create art and who are involved in art to realize a single person can think highly of himself and how dangerous that can be. Especially those pesky writer types. Geeze. Writer’s Takeaway: I don’t think I have much to add from the last Galbraith novel I read. Side characters are still important. Suspense makes a reader keep going. Though I think I would add that not giving your reader everything is a hard place to balance. You have to give them enough to make them keep reading and know they’re getting close to a solution but keep enough hidden for a big reveal. I thought this book balanced a bit too much on the ‘hiding’ side of this balance. I wish I’d been able to detective along with Strike. Enjoyable and entertaining. Four out of Five stars. Currently reading: I’ve made a bit of progress on Cloud Atlas by David Mitchell but I’m stuck in the middle of the book, in the Hawaii section, and so overly uninterested that it’s a struggle to keep going. I’ll keep making my way as best I can. No progress on I Am Malala by Malala Yousafzai. Stand by. I’m getting close to finishing The Samurai’s Garden by Gayle Tsukiyama. I might even finish it today I’m so close! I’m going to jump on Out Stealing Horses by Per Petterson as soon as I finish Samurai. I’m excited to get back into it. I made major progress with Made in America: An Informal History of the English Language in the United States by Bill Bryson while driving to and from Indiana for a conference this weekend. I’d like to think my progress with this book makes up for my lack of progress with Samauri and Cloud Atlas but I’m not sure it works that way. I began a new audiobook for Fahrenheit 451 by Ray Bradbury on Sunday. I was going to read my physical copy of this book, but listening to the audio will give me more time to get through some other physical books I’ve been slacking on. So far the narrator’s really good and I’m enjoying Bradbury again. Recently finished: I finished up the last twenty minutes What I Talk About When I Talk About Running by Haruki Murakami as I drove to Indiana. I liked this one and related to Murakami as a writer and athlete. I especially liked when he talked about triathlons! Yes, major geek moments for me. And two book reviews for you all this week! Please check out my reviews of Bird Box by Josh Malerman (5 stars) and Everything I Never Told You by Celeste Ng (3 Stars). I know a lot of you had been asking me what I thought of these so let me know if you agree, disagree, now hate me, etc. I’m about caught up on reviews and there will be one more tomorrow! 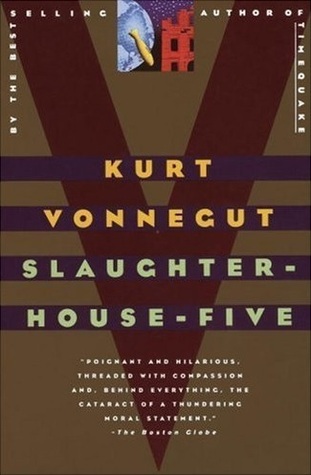 Reading Next: For an audiobook on my phone, I still plan to pick up Slaughterhouse-Five by Kurt Vonnegut. Yes, I’m pushing this back a little bit, but I do want to get to it. I’ve been meaning to read Sense and Sensibility by Jane Austen for ages. I have a really cool copy of the book that shows you where to fold the pages to make book-art out of it to spell out Love. That proably doesn’t make a lot of sense, but I’ll be sure to post pictures when I finish.